Amidst much panic and volatility in the market, equity market prices have been falling globally. Has the equity market really lost its value? Or is there another explanation behind it? * Disappointing data from the US and Europe couple with negative investor sentiment have dealt global markets pain. * Global Markets are whipsawing with wild and deep intraday swings. * Markets are starting to behave irrationally, fear has crept back into investors. * Focus on value, don't be affected by a nominal price. * Investors who keep calm tend to benefit from short term market volatility and panic as mispricing takes place. Over the past few weeks, investors encountered significant turbulence as various shocks have hit global capital markets. The tiresome sovereign debt crisis in Europe came back in July to haunt not only the peripherals, but Spain and Italy as well. Compounding weakness in the markets thanks to these indebted nations was the release of Eurozone as well as German GDP results for Q2 2011 this week. The numbers disappointed with growth coming to a standstill for the both the bloc and Germany. 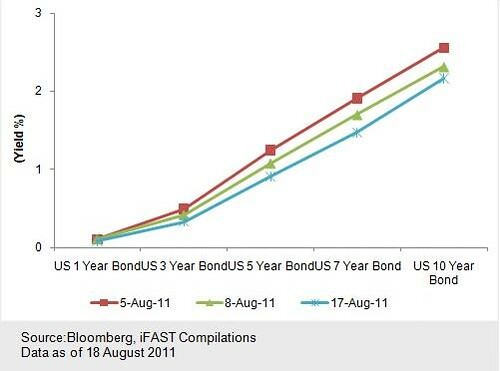 Over in the US, on the 5 August, Standard & Poor’s downgrading of the US’s credit rating from AAA to AA+ following the closure of markets had no visible negative effects on the yields of US issued treasuries the following week (chart 1). In the equity markets last week, investors were seized by panic selling and intra-day whipsawing, reminiscent of the dark (blood-red) days of the meltdown in financial markets during the unravelling of the Great Financial Crisis. The equity markets in the US and Europe bore the brunt of the sell off with the Stoxx 600 and the S&P 500 ending up losing -0.52% and -1.64% respectively, with most of the losses for the week being erased by wild intra and inter day swings (chart 2). This week, the Philly Fed index’s (an indicator of manufacturing activity in the US) freefall into negative territory (signalling a drop in manufacturing activity), a rise in unemployment insurance claims as well as a downward revision of US GDP data, saw the S&P 500 with a loss of -5.25%, while worries over in Europe saw the DAX lose -6.96%, and the broader Stoxx 600 lose -4.62%, for the week as of 18 August. 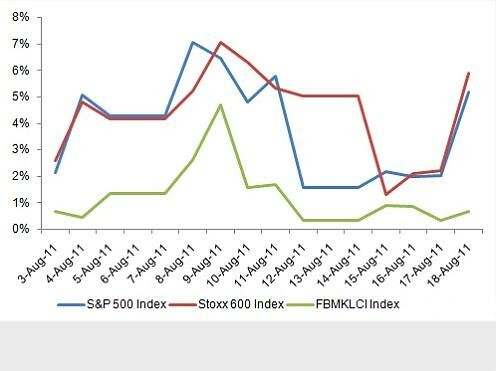 The VIX index, commonly known as the ‘fear index’, saw its levels spike by 105% from 3-5 August and 35% on 18 August. With such volatility and uncertainty plaguing the markets, we go back to the basics to remind investors of an important concept whilst market sentiment is gripped with fear. According to the Portfolio Theory by Markowitz, investments are a trade-off between expected returns as well as risk (chart 3). With markets reacting in such a volatile and thus risky manner, investors are demanding higher returns for investments during a period such as this. 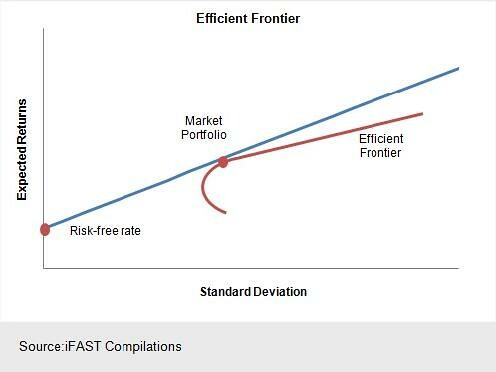 The efficient frontier represents a portfolio which provides the best risk-reward ratio. The question is then, given that we now know markets are at substantially elevated levels of risk, are the required/demanded higher returns based on market discounted prices sufficient? While prices of assets are the form with which one calculates nominal returns, many tend to ignore the returns yet to be unlocked from the intrinsic value of an asset. The intrinsic value of an asset is fundamentally calculated by the sum of the future income generated by the asset after discounting it to a present value (the time value of money effect). Thus, value would be the difference between the intrinsic value and the market price. As market prices of assets drop, intrinsic values rarely decline at the same frenetic pace with which the prices of assets do during periods of market panic. Thus, with heightened volatility in the markets, there is a greater opportunity for higher returns, albeit with added riskiness as the disparity between the figures which market prices an asset at and its intrinsic value fluctuate significantly. These fluctuations create opportunities which investors could take advantage off, depending on their risk appetite and market expectations. Within a longer-time frame, the actual values of assets are usually reflected fairly by market prices as the mispricing gradually eases. Thus, in the long run, investors who keep their cool tend to benefit from short term market volatility and panic as mispricing occurs due to irrational behaviour and fear.